What you learn from the process of transforming your body through physical training – the grit, toughness, perseverance, and commitment – should bleed into every other aspect of your life, making you stronger in every area of your life. But there’s a darkside to fitness, too. Sometimes, if we’re not careful, something that has the potential to positively affect our lives in a lot of ways can actually end up skewing our priorities and messing things up. 1. They build some muscle or lose some fat (or some of both) and build a body that they are proud of and that allows them to live life on their own terms. Fitness is a hobby that they enjoy and a skill that they practice – it’s one part of their lives. 2. They build muscle or lose some fat (or some of both) and build a good-looking body, but instead of stopping there – instead of leveraging that success to make improvements in other areas of their life – they become obsessed with all things fitness. Soon, all they can think, talk, or read about is fitness. It becomes a significant part of their identity. Now, here’s the kicker: Some guys want what I described in #2 – They want fitness to be a very big part of their lives, and to be a significant aspect of their identity. They have the time and energy to prioritize fitness in that way. Working out 6 days a week for a few hours at a time is something they will gladly do – not because they feel like they have to, but because they want to. But that isn’t true for everyone. There are priorities outside of fitness like family (or other relationships), careers, passion projects, etc, that demand more from us. For guys like this, fitness is something that needs to be one part of their lives, not something that everything in their life revolves around. So, which guy are you? Are you someone who’s in it for the ‘love of the game’, someone who wants fitness to take up a lot of their time and energy? Or are you a guy who wants the benefits of fitness – the grit, confidence, health, and strength – so that every other aspect of your life can be better? You gotta decide, and the choice you make will be the difference between a life defined by fitness, or a life enhanced by fitness. Consider the reasons why you got into fitness. I’m willing to bet that you don’t work out so that your life could start revolving around all things fitness. It may have started out that way – a few years ago, you may have been okay with spending a lot of time at the gym and carefully tracking all of your food intake. But that was before you wanted more out of life. That was before you realized that a fulfilling life isn’t spent dedicating every waking moment towards looking perfect. You’re here because you want something more. A more muscular, defined body that you can be proud of? You betcha. But there’s more to it than that too, right? You want a bigger, more remarkable life. A life of health, confidence and freedom. The kind of life that building a body that you can be proud of provides. And building an awesome body plays a big part in living the kind of life that you want. When you are stuck in a scrawny or skinny-fat body, you can feel like a failure. Not only when you are in the gym, but also when you are out living your life. Being able to transform your body and build a muscular, strong physique that can literally change your life, can be like the first domino that ignites positive change in other areas of your life, too. But that’s the thing: it’s just ONE domino. The goal isn’t to become obsessed with all things fitness or seeking perfection. When you don’t see fitness as ONE of many dominoes that make up your identity and your life; and instead start defining yourself by your six pack or by how much you can bench press, you set yourself up for failure. You bastardize the life-changing effects that transforming your body can have. You fall into the trap of thinking fitness – more muscle, more fat loss, more strength – is the way to happiness. And you start sacrificing anyone or anything that seems to get in your way. The guys who change their bodies significantly and then use that positive momentum to change other areas of their lives are the one’s who find happiness, become the best version of themselves, and live fulfilling lives. The guys who change their bodies and then think all happiness and purpose and identity is found in taking things further – in trying to build the “perfect body” or in becoming obsessed with strength or performance – those guys end up spending a whole lot of time chasing something that ends up leaving them unfulfilled. Here’s the thing that most guys just flat-out fail to acknowledge, recognize, or accept: You don’t have to have a perfect body or look like a fitness model or celebrity to gain the health, confidence, and life-smashing positivity that comes with mastering your body. “Good” allows you to have a life outside of fitness. It allows you to prioritize other people and things that are important to you. “Great” confines you to the fitness lifestyle. It demands the majority of your time, energy and resources. Listen, I’ve had a fitness-model worthy body. I’ve had a ripped six pack with veins popping out all over. And you know what? It doesn’t feel a whole lot different than when I looked 90% as good as that. I wasn’t more confident. In fact, if anything, I was less confident because I was so focused on perfecting every little detail. And I sure as hell wasn’t free. I didn’t even take an extreme approach, but the attention to detail that is necessary to get in really good shape can be exhausting if you have priorities and responsibilities outside of that. I got in shape for a contest, and for that short time, it wasn’t horrible. But I can’t imagine sustaining that long term. It would require me to obsess over how I look, what I eat, and what I do in the gym all the time. While this blows the minds of some, and others think I’m slinging heresy; it’s really not that outlandish. But most people overlook that you can experience more confidence, health, and freedom with a body that’s “pretty good” – you don’t have to be “fitness model good”. A few years ago, I wised up: I started to clearly define what I really wanted to get from working out. I was tired of constantly feeling unclear about what I wanted from fitness. I was caught in a yo-yo cycle, bouncing back and forth between being completely obsessed with working out and tracking nutritional intake, or feeling completely apathetic towards it all. I had lost the passion I once had for working out when things were simple and I actually enjoyed the process without hyper-focusing on the end result. And perhaps most of all, I was pissed off at the fact that despite making a lot of solid progress, I still felt inadequate in the way I looked and in my performance in the gym. I needed something to get me back on track so that I could refocus on why I was doing all of this in the first pace. If you’re feeling frustrated with the progress you’ve made; if you still feel dissatisfied with the way you look or feel or perform, even though you’ve made a lot of progress – you need to start by getting a clearer vision of what you’re actually trying to achieve. Only then will you be able to rekindle the passion you once had for fitness and distill everything positive that physical training has to offer. 1. What is my ultimate goal from my training and nutrition routine – what is it I really want to achieve (Do I really want to build a ‘perfect’ body – and embrace all of the dedication/commitment that takes – or is my goal actually to look ‘good’ while still having a life outside the gym)? 2. What’s the point (why do I want to achieve this)? 3. How much time do I have, realistically, to dedicate to working out each week? 4. How meticulously do I want track nutrition (Will this just affect me or do I have a family/partner that this will impact as well)? 5. Do I want fitness to be a hobby that enhances all the other aspects of my life – or do I want fitness to be something that most of my life revolves around? 6. Does my current plan match up with what I said in the questions above? 7. If no, what changes do I need to make now to my training and nutrition plan so that it does match up with what I ultimately want to achieve? These questions will help stop the tendency to blindly follow ‘supposed tos’ and instead provide some clarity about what you’re really trying to do with fitness and how that fits into the rest of your life. Remember: there’s no such thing as the “best workout” or the “best nutrition plan”, it’s all about your goals. These questions will help you craft a plan that’s great for YOU. And a big part of that is fitness – it’s building a strong, muscular body. But there’s more to it than just the physical part, too. We want more confidence, a stronger mind, and a presence that commands respect. We don’t want to be just another face in the crowd, we want to be a leader; someone others look up to. Fitness – building a strong, badass body – can help with all of these things. When you work hard in the gym, you learn valuable qualities of self-discipline, grit, and develop the ability to set goals and put in the work necessary to achieve them. When you see the way you can transform your body, and when you feel the power that comes with knowing you are strong and conditioned; your confidence skyrockets and other people notice. Some guys realize these benefits and fall into the trap of “more.” Instead of using the progress they’ve made physically as a catalyst for change in other areas of their life, they become obsessed with the physical part of change. The key to getting the most out of fitness lies in letting the success you find in transforming your body bleed into all other areas of your life. Instead of becoming obsessed with just the physical aspect of transformation, you see the positive effects that changing your body can have and aim to use that positive momentum to optimize every other area of your life. When you first get into exercise and fitness, it’s okay to allow it to take up a significant part of your thinking on a day-to-day basis. But after a while, after you have made some significant changes, it’s best to cut back the focus on fitness and start to optimize the other areas of your life. This doesn’t mean you stop working out or “let yourself go.” It just means that you learn to focus your efforts on a few critical things. It means you stop reading 75 different blogs about building muscle and reach a “zen-like” state of understanding that consistency is the most important aspect of long-term success. 1. Learn to use the positive momentum and habits you learned from changing your body to change other areas of your life. 2. Discover how to continue the “habit” of fitness so that you can continue experiencing the benefits of having a strong, conditioned, healthy body. Once you’ve made the initial transformation, the aim is to stay consistent enough to continue seeing progress over the long term – something that doesn’t take extreme tacts, expensive supplements, or an obsession with all things fitness. As simple as it is, that quote carries an incredibly profound message. Fitness – building a strong, muscular, and athletic body – should enhance all other areas of your life, it shouldn’t become the center of your life. The goal is to take all of the good things provided from fitness and allow it to make you stronger in all areas of your life. The goal is to realize these benefits without letting the pursuit overtake your life. The goal is to acknowledge that there is a point of diminishing returns with fitness, and to stay on the side where we are experiencing the benefits without all of the obsession and frustration. Keep the goal, the goal. 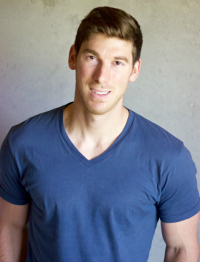 Eric Weinbrenner is the founder of Muscle That Matters, a website dedicated to turning average joes into the strongest, most badass version of themselves by providing simple, effective, muscle building, fat loss, and mindset strategies. Tired of the Dadbod? Get jacked instead. Pick up your free copy of The Anti-Dad Bod Plan and start building the body you want.